Happy Friday friends! What a week - I have been going to sleep almost every night this week around 9:30 PM because of pure exhaustion/trying to get used to my new routine! I'm hoping to get my fill of sleep and relaxation this coming long weekend!! Linking up with Amanda and April for a different take on Friday Favorites!! I randomly saw a promo for this and thought it looked really funny! 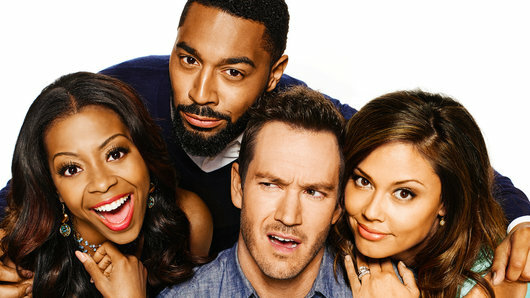 The odd thing is that the girl who is in the promo or even possibly the first episode, isn't Vanessa Milano Lachey who is now in the show - but regardless, I feel like a half hour of my life can be spent watching this. Possibly with DVR so that I can fast forward through commercials really making it only 22 minutes of my life! 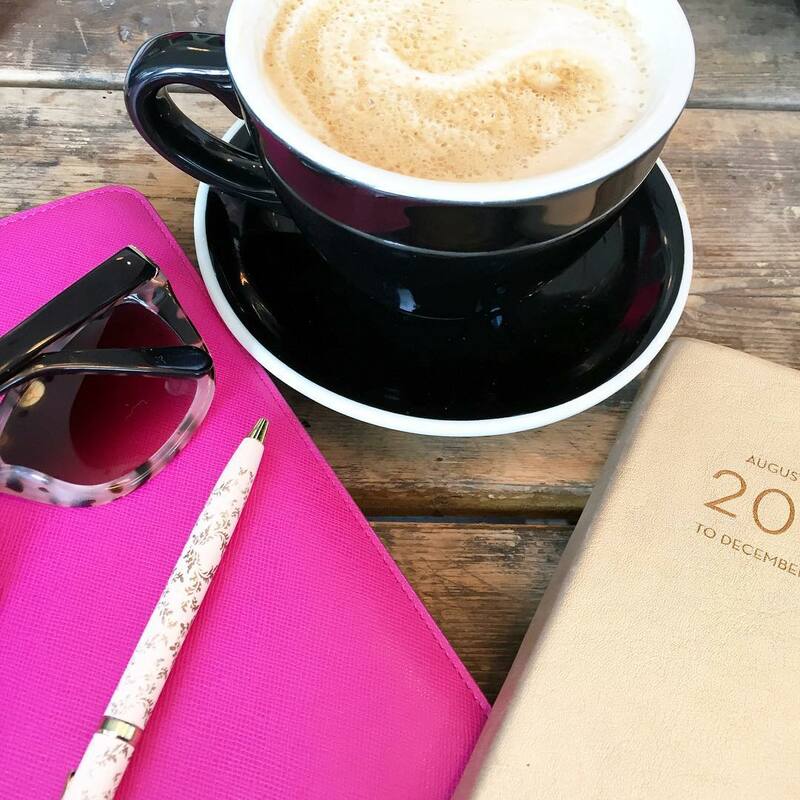 +Absolutely loved this interview with Blair from Atlantic - Pacific and proof that we can have a successful blog and still maintain a career in the corporate world! 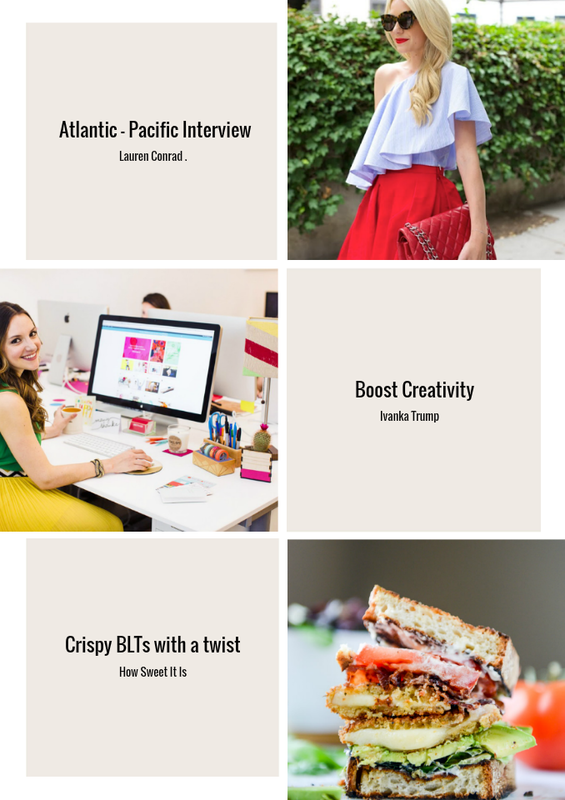 + Feeling a little lack luster at work? Try these 10 tips for boosting creativity! +Holy amazing sandwich everyone - seriously I'm drooling just looking at this BLT!! Hope you all have amazing long weekends - the link will be live on Monday if you want to link up for Weekending!! Three cheers for the first week at your new job. I'm so proud of you [even though I miss our chats] and know you are going to do great things. Enjoy, enjoy, enjoy this weekend, you've totally earned it! I'm intrigued by Quantico since we live SOOOO close to the base. I will be honest and will totally judge it if they act like they can get to DC is five minutes because it's at least 30 minutes away no traffic. I actually have quite a few friends stationed there so I'll definitely be asking them their thoughts. LC can do no wrong, she is just incredible. Can't wait to read more of your links. Hope you have the best weekend <3! Wow, a week under your belt has to feel good!! I am excited for Quantico and Limitkess also as is my husband. The only TV we have been watching this summer is binge watching series and I'm ready for a weekly show. I'm also excited about Grandfathered with John Stamos!! ;-) I so need to read that interview with Blair. I have always admired her! And YOU!! Happy Weekend gorgeous!!! I'm such a huge fan of Blair - thank you for linking it! And I've been seeing the commercials for Blood and Oil and it looks real good! There is a good line up this fall, but I am a comedy girl. I am looking forward to the show Dr. Ken! It looks absolutely hilarious! I hope you have a weekend full of rest and relaxation. Ooo Blood and Oil sounds interesting! One of my fav shows, The Mindy Project, is moving to Hulu...so guess I'll be getting a subscription shortly lol. I feel you on the crazy week - I have been in bed early, too!! I cannot wait for Blood & Oil, it looks sooo good!! I have been watching Gossip Girls on Netflix so I'm excited to see him on something else as well. I bet my husband would like Limitless since he enjoyed the movie. I'll have to tell him about it! Empire starts back up this month and I can't wait! I think the only show I'm looking forward to this fall is Empire - are you in to that? And maybe Scandal now that I'm all caught up! Blood & Oil looks good but I can't take it seriously with Nate on there LOL. All of these shows look really good! I am definitely going to be tuning in to Blood & Oil because...Nate! I also heard Chuck Bass is going to be on a new show but I can't remember what it's called! I'm so looking forward to the return of Chace Crawford haha, I hope the show lives up to its potential! 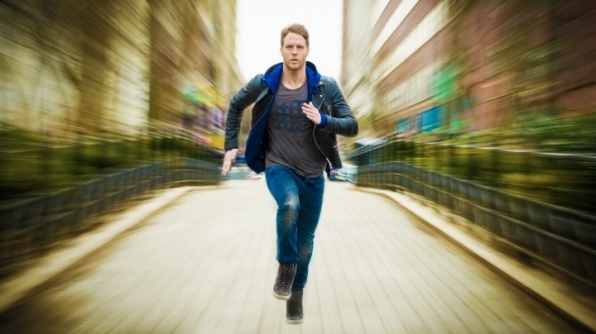 And I'll have to check out Limitless, I haven't seen any previews but I enjoyed the movie (and really wish I had that pill, it would be amazing)! Hope you have a relaxing weekend! I've seen all of the previews for Blood and Oil too, and I agree that it kind of looks like Dallas a little bit. It still looks interesting enough to check out though! And Quantico looks really good too! I love all of the spy type of shows so it should be right up my alley! Hope you enjoy your three day weekend! Can't wait to read that article on BEE! I adore her! I have almost every one of these shows on my radar. I'm such a tv nerd and love new shows! 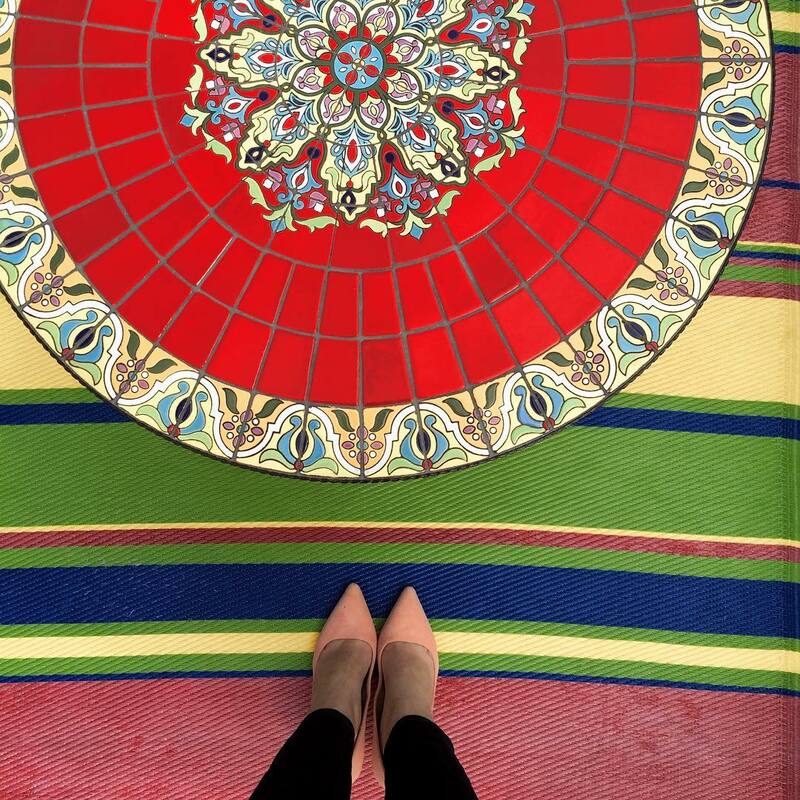 Thanks for sharing and have a wonderful weekend love! The previews for Blood and Oil have me intrigued too! I hadn't seen previews for the show with Vanessa Lachey! I saw a preview for Limitless and thought it looked good! Have a great weekend! I so want to see Blood & Oil! Mainly for Chase Crawford, but you know, maybe for the actual storyline too? Happy Friday! that BLT has my mouth watering!!! I've been wanting to start watching a new show, might try one of those you listed! happy weekend girl! great friday list! i cannot wait for those shows - especially blood and oil! looks so juicy and will be a good replacement for my lack of gossip girl + revenge :) not that i need more shows to watch lol. I swear i can't keep up with the ones i'm already addicted to :) have a great weekend!!! I hope you get some rest this weekend! I'm super intrigued by blood and oil too! I just love Chase Crawford! ;) have a great weekend! Hope your weekend looks like that first picture! Headed over to check out that interview! Thanks for sharing! I haven't heard of any of these new shows but I'm intrigued by all of them. Will have to add them to my list of shows to watch this fall. Have a wonderful weekend. I can't wait to watch quantico. I love all of those sort of agent shows. And of course so excited for Scandal to come back! What a great idea - I feel like I'm always late finding out about great shows and then I'm like... should I try to jump in once they've already started? #firstworldprobs Hope your new job is going well! Congrats on your new job Biana! Just catching up here. Sorry I've been MIA lately! I'm so excited for all the fall shows! Def looking forward to Scandal and I love The Good Wife. Quantico looks soo good! I'll have to check it out. Hope you have a great weekend! Those shows sound really interesting! I have actually never watched Scandal but I might need to start, I've heard so much about it! Happy 3 day weekend, hope you get lots of rest! Why have I not heard about any of these shows?! Where have I been? Granted, I only watch an hour of TV or so a day and it's usually cable - Bravo or Travel or another another similar channel... Let me know how they are! Girl, welcome to my schedule! I don't know how people stay up later than 9:30pm. When you're up by 5 or 5:30, falling asleep that early just happens! Catching up here, congrats on the new job!! So exciting!! I'm looking forward to new shows this Fall too, Quantico looks so good! Have a great weekend friend! I can't wait to check out the new shows this fall! Truth Be Told is definitely on my list! Happy Friday! 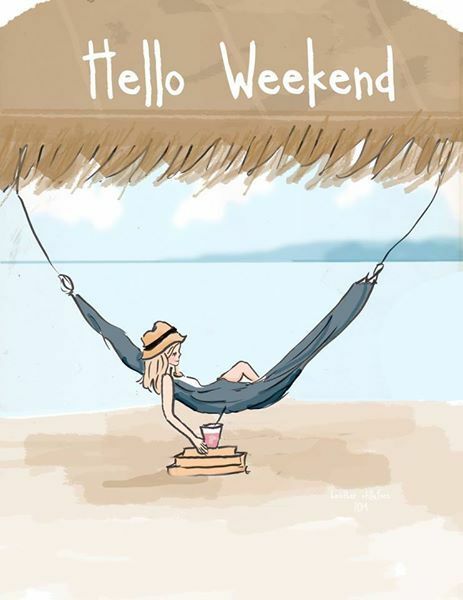 I hope you get caught up on your relaxation and rest this weekend! Gotta love Fall and the return (and start) of all the good shows!! I'll be binge watching a lot in the coming weeks during all the nursing sessions newborns go through, ha ha! Oh my gosh that sandwich looks insane! I hope you had and survived a good week at the new job. Cheers to a long weekend! I am sooo ready for a 3 day weekend too! It's been a crazy week and it sounds like everyone could use some rest! Hope your start at your new job as gone well!! Getting into a new routine is exhausting! And that sandwich ... mmmm. Loved the Blair interview too. I could not maintain the schedule she outlined!!!! Thanks for the fall lineup! I loved Limitless so i can't wait to watch the show! I think I’m the complete opposite – I’ve been going to bed way too late trying to keep up with things – quite ready for the weekend! 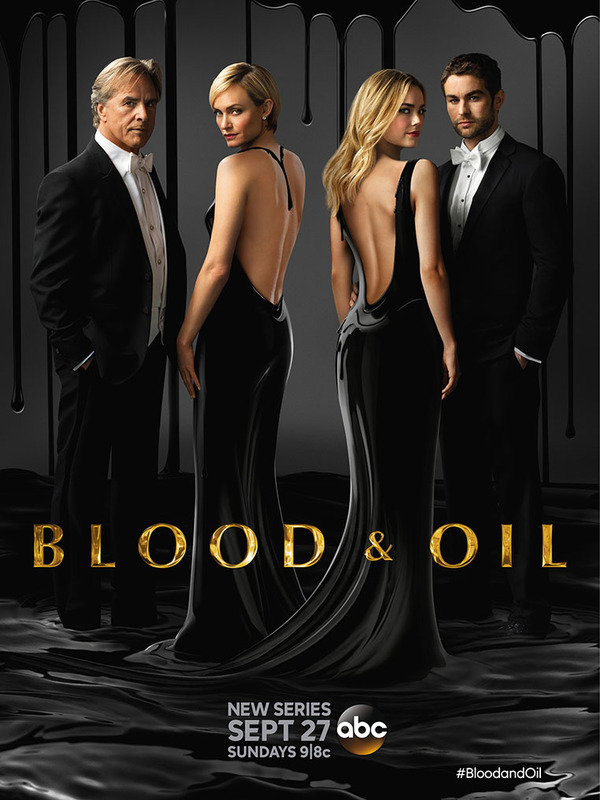 I’m so excited to check out Blood and Oil – it looks like it’s going to be a good one. I love all these shows!! I'm super excited about the Fall lineup, I may borrow this idea and post about some of my favorite Fall shows I'll be tuning into! Have a nice and relaxing labor day weekend!! Happy Friday gurlie, hope you get plenty of fun rest and relaxation this weekend! omg I haven't heard of any of these ;) I am SO out of the loop! I am with Caroline! I haven't heard of any of these--probably because I only watch recorded TV these days ;) I mentioned you today on my blog because of your great blogging tips. I have been using your tip for leaving my link in blogger comments and wanted to thank you! Thanks so much for sharing! I can't wait to find a new show to watch! Have a great long weekend! oooh i have been looking for new tv shows! i have tried a couple recently but they haven't grabbed me. and that sandwich looks so good! I'm also looking forward to Quantico - the story line seems so intriguing! And, of course - I can't wait for Scandal, either. :) Have a great long weekend, girlfriend! Um... pinning that sandwich... may have to try it this weekend!! I'm very intrigued by Blood and Oil. And Quantico. I haven't heard of the other shows but will check them out. And that sandwich. My word. Have a great weekend resting up! Blood and Oil sounds really good! I need to set series recordings for some of these since I ALWAYS forget to start watching every series I want to lol. Limitless?! I didn't know they were making it a show! I loved the movie with Bradley Cooper, he's my man ;) haha! Enjoy your long weekend, gorgeous!! I SO need some new shows to watch this fall. Thanks for putting these together. I've written a few on my calendar. (; So excited for How to get away with murder to come back! I'm pretty stoked for Fall TV! I want to see Blood and Oil! I don't think Quantico will last for some reason, but the main guy is cutttte. Happy weekend! Blood & Oil and Quantico are both on my list to DVR. I am getting excited for some Fall shows to come back too. That BLT looks yummy! Happy Friday! Everybody put your hands together for SCANDAAAAL! I can't wait! Crispy blts? Yum!!! I've been getting this tuna takai blt from a restaurant near my job. It's ammmaazzinnnggg. Thanks for the TV recs; I can't wait for The Affair and Homeland to return next month, also! 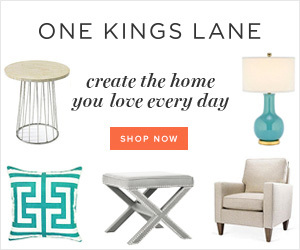 YES to a BLT all day long, breakfast, lunch and dinner, please! Happy long weekend (and cheers to much-needed catch up time on sleep!). Such a great list of shows! I am really intrigued about Quantico-so excited for it to premiere! Hope you get lots of rest this weekend! I have fallen asleep on the couch before 9 three different nights this week. Oops! I have not heard of any of these shows but I will have to check them out. Have a great weekend! I love the Blair Eadie interview! She's one of my fave bloggers. Ooooh, some of these look good! I can't wait for the fall TV season to start :-) have a great holiday weekend girl! I so need to get out more! I have like two shows I watch and that's it. NCIS and Scorpion. Thanks again for your blog tips! I'm following you on GFC now too. I didn't realize I wasn't! Happy weekend to you! wahoo for the weekend! have a good one! DVR is going to be what I miss most about having cable. Now I feel like I need to write out an actual TV schedule of what I want to watch so I can make sure to catch up with it online instead of just having a weekend DVR clean out ha. I had honestly forgotten all about fall TV returning so this just made my day! Cannot wait for Scandal and Blood & Oil looks super intriguing, too! Limitless the movie was really good. I'm interested to see what they will do with the TV show. Limitless is my favorite. And I'd like to see Quantico. Hope you get the rest you want! Excellent shows coming up! I hadn't heard of Quanitco... it sounds good though! I haven't heard of any of these shows but the Limitless picture made me feel dizzy haha! I love fall TV! I'm feeling sooo out of the loop because I haven't heard of any of those shows yet-- but Chase Crawford?? !